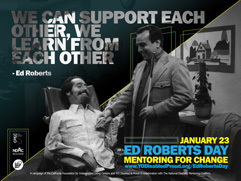 to celebrate Ed Roberts Day by engaging in National Mentoring Month! Mentor Resources Valuable mentoring information all in one spot! The mission of NDMC is to increase the awareness, quality, and impact of mentoring for individuals with disabilities across the nation. Visit the site to learn more, review the 40 Member organizations and and sign up for their mailing list. The Susan M. Daniels Disability Mentoring Hall of Fame was established to honor those who are making a significant difference in the lives of youth and adults with disabilities through mentoring and to raise awareness about the importance of mentoring for individuals with disabilities. Visit the Hall of Fame to read about the Class of 2015 and 2016 inductees. The Class of 2017 Nominations will open on March 1st! RAMP™ operates in 11 communities across the country to serve youth, including those with disabilities, involved in or at risk of becoming involved in the juvenile justice system. 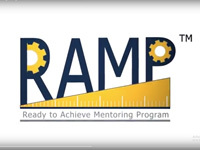 RAMP™ is a career-focused mentoring program with a particular emphasis on careers in science, technology, engineering, and math (STEM) fields. A mentoring program with the goal of helping young people with disabilities meet their full potential for personal development and independence. A network of 60 local chapters of public and private schools, colleges, universities, and local businesses, working together to provide mentor/mentee experiences for students labeled with language, reading, and math based learning disabilities (LD) and/or attention deficit hyperactivity disorder (ADHD). This NCWD for Youth Guide is intended for individuals designing mentoring programs for youth, including youth with disabilities, in the transition phase to adulthood. The NCWD for Youth Guideposts can help steer families, institutions and youth themselves through the transition processes. Guidepost 3, Youth Development and Leadership, emphasizes the importance of mentors and roles models, including people with and without disabilities, for youth in transition. 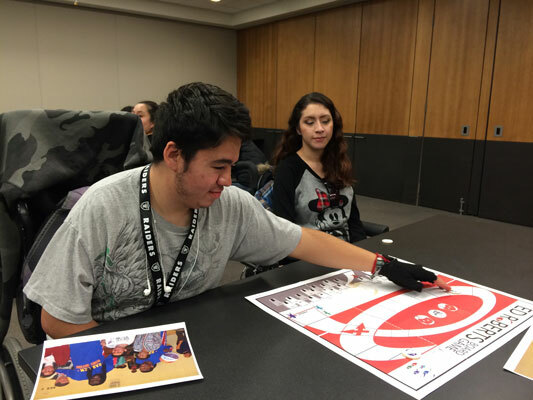 A training manual for adult volunteers interested in mentoring youth with disabilities. It was created through a collaborative effort by Mass Mentoring Partnership and Partners for Youth with Disabilities, and funded by the Mitsubishi Electric America Foundation. 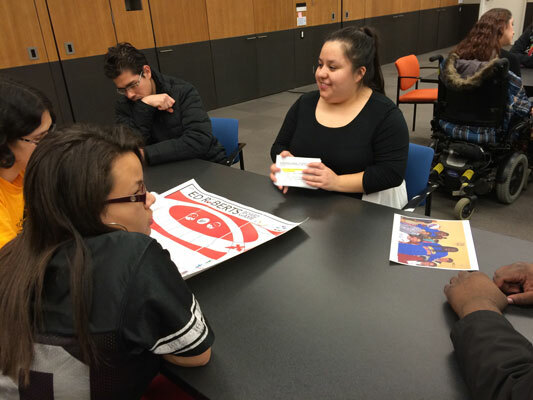 Expanding Access Inclusion for Youth with Disabilities shares inclusion strategies for individuals working in the youth programming arena, including tips on inclusive communications, Universal Design for Learning, inclusive marketing, and more. It also provides hands-on activities for staff and volunteers to practice what they have learned. Liberty Mutual Foundation for funding the development of this resource! 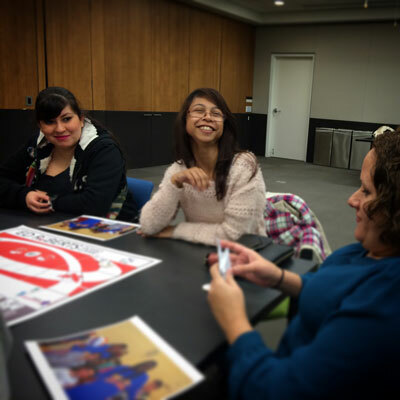 Best Practices for Mentoring Youth with Disabilities to help organizations start their own mentoring program or expand a current program in order to include youth with disabilities. 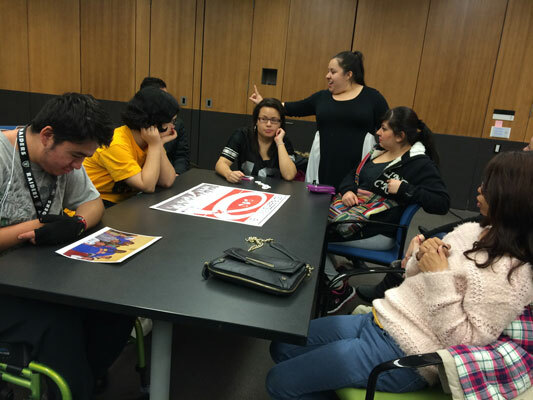 This PDF document was published by Partners for Youth with Disabilities and funded by the Mitsubishi Electric America Foundation. 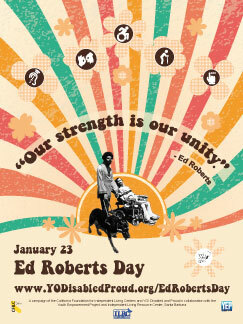 About Ed Why do we celebrate Ed Roberts Day? 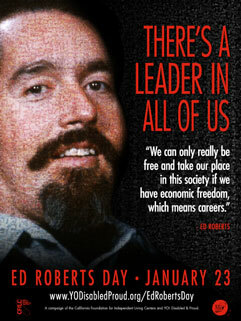 Ed Roberts was both an advocate and an activist. He was a leader in the civil rights movement and championed the rights of people with disabilities. 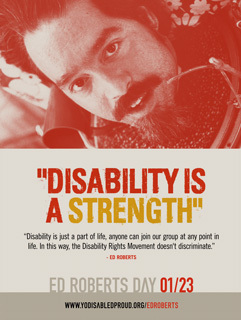 He was the founder of the first Center for Independent Living and the World Institute on Disability. 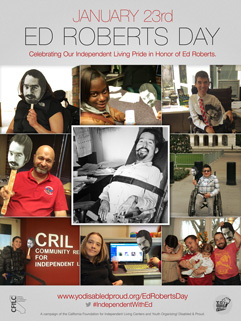 Ed advocated for his right to attend a university and was a activist in the 504 sit-in held in San Francisco. He was known for a lot of things by a lot of people, but most importantly he believed in empowering others to become advocates and activists. 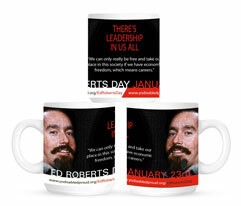 Videos of Ed Roberts Watch or hear Ed Roberts himself in three different video interviews with him. Ed Roberts discusses the history and future of the independent living movement in the U.S. at the innagural conference of independent living. 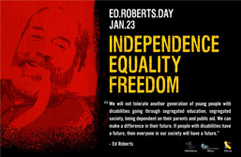 Video documentary of Ed Roberts titled, "Free Wheeling" that chronicles through some of his day-to-day in the community. Ed Roberts with TV show 60 Minutes back in 1989 with Harry Reasoner. 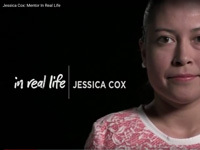 Mentor Stories Enjoy some mentoring testimonials! 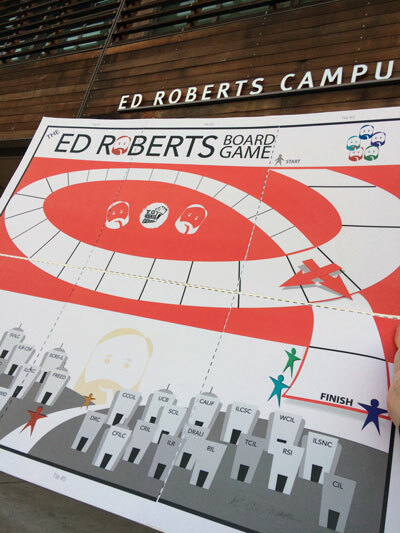 The Ed Roberts Board Game Want to try your hand at some Ed Roberts trivia? 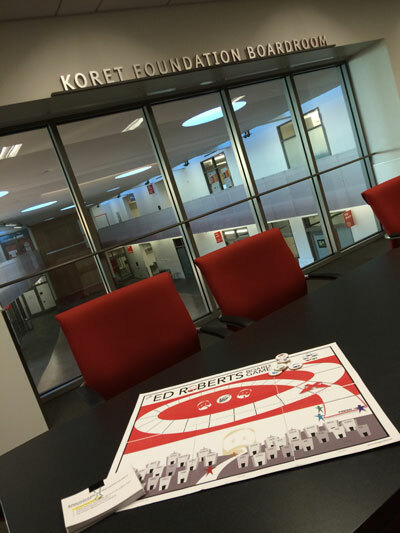 Gather some friends and have some fun with this FREE downloadable board game! 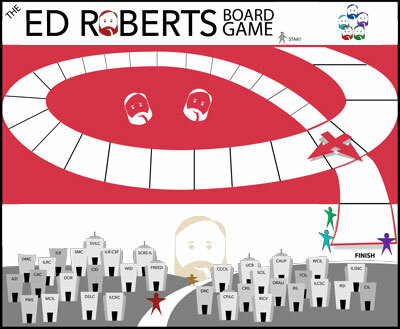 Download the game board and tokens by clicking [HERE]. Assembly instructions are provided within. Download the trivia questions and instructions [HERE]. 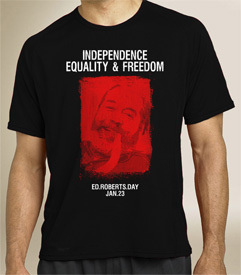 Ed Roberts Stuff Make a donation to the YO! 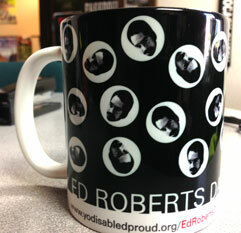 Store to show your support for Ed Roberts Day and receive Ed Roberts Day mugs, posters, shirts, and more!